You can track your order by logging into your account. Click HERE. View your recent order. Scroll down to Items Ordered and click Track your order. Don't have an account? Call customer service at 800-704-4474. Forgot your password? No big deal. To reset your password, go HERE. HOW DO I CANCEL MY ORDER OR MAKE A RETURN? CAN I ADD OR CHANGE ITEMS TO MY ORDER? No, items cannot be added or changed to an existing order once payment has been made. If you have any concerns about an order that has already been placed, please contact an GSI Outdoors Customer Service Representative at 800-704-4474. HOW DO I ORDER IF I AM IN CANADA? We do not currently sell directly to Canada. Please visit our dealer locator for a list of trusted sellers HERE. We offer most parts on our website HERE. If you cannot find what you are looking for please call our customer service at 800-704-4474. All products designed to come in contact with food or drink are BPA free. WHY CAN I NOT BUY GSI OUTDOORS FUEL FROM THE WEBSITE? Due to hazmat regulations we are not able to send fuel through the mail. Please visit one of the following trusted retailers to purchase: Dicks Sporting Goods, MEC, FGL Sports, and Atmosphere. Click here to find the closest Dicks Sporting Goods, Academy Sports, MEC, FGL Sports, or Atmosphere. HOW DO I CLEAN MY HARD ANODIZED POTS AND PANS? We suggest you hand wash with soapy warm water. If your hard anodized pots and pans have a film try rubbing a little lemon juice, vinegar and even ketchup. We use a high grade 3000 series aluminum stock that is formed into a pan or pot. Then we hard anodize treat the entire pan before applying the non-stick (PTFE e.g. Teflon) interior coating. The hard anodization process produces a coating of aluminum oxide, penetrating the surface to create garnet hard surface that is more durable and longer lasting than painted coatings. Unique in our production method is that we provide a hardened surface under the non-stick coating, providing longer durability, greater resistance to impact abrasion and yet superior conductivity to steel and titanium (aluminum is three times more conductive by weight than steel and titanium) reducing hot spots and pan burn through. This process is more expensive but we feel that it is one of the key performance enhancing processes in the production of our pots and pans. The outshot is the hard anodizing process is environmentally safe; the pan is engineered with features to maximize its usefulness and longevity. Some of these are our spiral pattern bottom which prevents the pan or pot from vibrating off the stove, our externally mounted handle grip bracket, which allows the pan or pot to be handled without scratching the interior non-stick, the pot lid is a frying pan instead of a single use flat lid, the hard anodized surface is inherently non-stick and non-staining allowing for easy clean-up and less water consumption. WHAT GRADE IS GSI STAINLESS STEEL? Glacier Stainless is premium 18/8 stainless steel construction. With a brilliant, rust-proof finish and the strength that only steel can provide, Glacier Stainless is the material of choice for cooking over coals or camp fires. Of course, our premium 304 (18/8) stainless steel construction is also fully-recyclable, free of BPA , PFOA and Phthalates, and completely dishwasher safe. CAN THE STAINLESS STEEL COOK SETS BE USED ON AN INDUCTION STOVE? Stainless steel pans will work on an induction cooking surface if the base of the pan is a magnetic grade of stainless steel. If a magnet sticks well to the sole of the pan, it will work on an induction cooking surface. 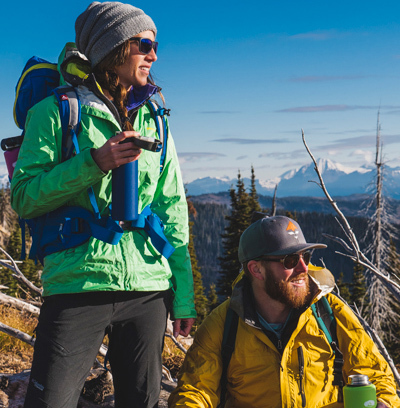 WHAT IS THE DIFFERENCE BETWEEN THE PINNACLE AND BUGABOO SERIES? The Teflon coating, the type of aluminum the pots are made from, and the type of plastic the tableware is made from. Please see our Cookware page for more detail. CAN YOU USE FRYPANS ON AN INDUCTION COOK SURFACE? No, the exterior surface of the pan is all aluminum, in order to use with an induction-style cooking surface the bottom of the pan needs to have steel or steel plating in it.